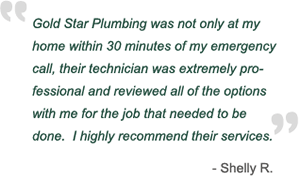 Gold Star Pluming Service, Inc. is the premier plumbing company offering a wide variety of residential and commercial services to our clients in Orange County. We are known to pay exquisite attention to detail while making your satisfaction our number one priority. Orange County's trusted source for faucet leaks, sewer lin problems, water leaks, water heater repair, clogged drains, backed up toilets and any plumbing needs. We guarantee all of the plumbing services. Please call us today to schedule your appointment with California's true professionals at work for you! General Plumbing and Drain Service.